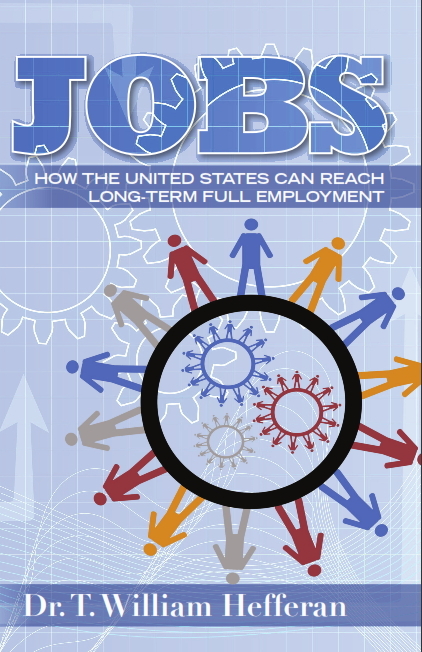 In JOBS, Dr. T. William Hefferan, DBA, MBA, CCIM, CPM provides a stunning approach to achieving long-term full employment in the United States and ending the repeating cycles of high unemployment. Dr. Hefferan reveals the essential shift in how we need to think about jobs and employment as the U.S. accelerates its timely transformation into a knowledge worker economy. This profound shift will invigorate our heritage and foundation of innovation and entrepreneurship – including restoration of our global leadership in education and learning – leading to a dawn of new discoveries that create exciting new and unique careers. With over 23 years of experience as President/CEO of a 100 employee company, Dr. Hefferan decided to put his corporate work experience together with his academic background and solve one of our most significant societal problems. His unique approach to end the persistent ups and downs of unemployment includes a peer reviewed research study he designed specifically to discover ways to solve the problem. Capitalizing on the focus of his doctorate – organizational psychology and social science research — in 2009 and 2010 Dr. Hefferan interviewed job seekers, employees, employers, HR professionals and CEOs across the United States using unique questionnaires he designed to uncover unique solutions to the problem. Each group has their own thoughts as to the needs and wants of the other; however, Dr. Hefferan’s concept was to look at those viewpoints side-by-side to determine if there were gaps in the communications strategies and perceptions of each group that may affect optimal employment relationships. The results are surprising as they reveal the differences and misperceptions of each of the groups — employers and employees — Dr. Hefferan interviewed. These differences lead to less than optimal hiring and often to poor employment relationships. Obviously the performance of the company is significantly affected and the employees are not only disengaged at work, but many dislike even showing up for another day at a job they don’t like. JOBS draws the reader deep into visualizing the solutions through heartfelt real-life personal stories and experiences of the research participants regarding all aspects of employment. Readers clearly see how everyone can benefit from this journey to create a steady stream of beneficial and rewarding jobs. Job seekers and employees learn how to secure their perfect job, employers learn how to attract and retain top-tier employees, and entrepreneurs learn the value of putting their ideas and initiatives to work. Readers learn the value of ethics and authenticity in the workplace as well as why everyone in an organization can be a leader, adding value to the company and the employee’s career growth. Education and retraining, innovation and entrepreneurship are shown in their increasingly critical role in putting every American to work in their dream job. Just like the financial melt-down that caused the Great Recession, we will continue to face new and complex challenges, such as globalization and economic challenges that could again cause massive unemployment with little warning. Together with the findings of his study, germinal research, and the input from contemporary experts and authors in the area of employment, this groundbreaking book provides a blueprint for America to reach long-term full employment. Dr. Hefferan demystifies our journey to ending persistent ups and downs of unemployment with his original entertaining presentation style. Readers are energized as they see how they can participate in this contemporary revolution to a new America that will always have meaningful and rewarding employment.